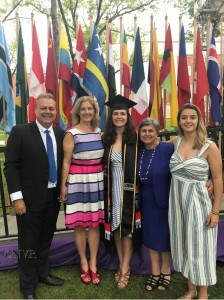 WILLEMSTAD - Mikayla V. Ribeiro from Curaçao recently got her bachelor's degree at the prestigious Amherst College, Massachusetts. Her major was 'English and Black studies'. Amherst College is the third oldest educational institute in Massachusetts, U.S.A..
Mikayla Ribeiro is the daughter of Kate and Norberto Ribeiro and at the age of 15 she was invited to attend the United World College (UWC) in Maastricht, the Netherlands in 2012 with a scholarship presented by then Prince Willem Alexander. The UWC is an organization of 13 different schools in 13 countries. They accept students for their final two years of high school, and are committed to "make education a force to unite people, nations and cultures for peace and a sustainable future." Queen Noor of Jordan is the President of the UWC, and King Willem Alexander was a graduate of the UWC Atlantic School in Wales. Mikayla Ribeiro after successfully finishing the United World College continued her education at the Amherst College. She was a student at the International School of Curaçao and was very socially active on the island of Curacao. Her next step is to continue for her Master's degree. Photo: Mikayla Ribeiro BSc with her parents, grandmother and sister.